There will be a gap between the fee for your anaesthetic and the total rebate you receive from Medicare and your private health insurer. It would be more accurate to call it a private health insurance shortfall which is the direct result of deliberate federal government policy. The Medicare rebate, on which your total health insurance rebate is based, has not been indexed adequately by the federal government and has been steadily eaten away by inflation over many years. Successive federal governments have been steadily reducing their support for private medical care and blaming the medical profession when gaps are the inevitable result. Since 1985 Average Weekly Earnings (AWE) have gone up by a factor of 3.5, the CPI has gone up by a factor of 3.1, but your Medicare rebate has only been increased by a factor of 1.7. This erosion of Medicare rebates continues. 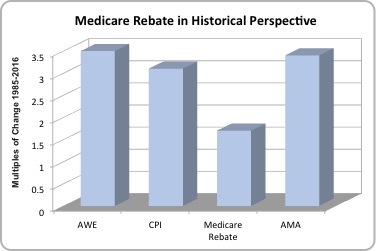 From 2013 to 2016 your Medicare rebate increased by 0% while AWE went up by 5.3% and the CPI went up by 5.1%. The deliberate government policy of a continued freeze on rebates until 2020 means that gaps will only increase in the future. The Medicare rebate is the core of your total health insurance rebate. Each private health insurer offers a range of schemes for you to choose from but all take Medicare as the baseline to set how much they will pay out. Of every $100 that you pay in private health insurance premiums only about $12 goes to doctors, of this only about $2 is paid to anaesthetists; administration and hospital costs account for the rest. The fee for your anaesthetic will be in excess of the Medicare rebate but less than the fee that the Australian Medical Association recommend as being fair and reasonable. The AMA’s recommended fee has been increased over the past 30 years by a factor of 3.4 or slightly less than the rate of increase in Average Weekly Earnings. Each anaesthetist in this practice sets their own individual fees but the average is 52% of the AMA’s suggested value. More detailed information about how anaesthetic fees are calculated can be found on the Australian Society of Anaesthetists website here.